Cassandra is the owner of Fierce Hearts Wildlife Rehabilitation. 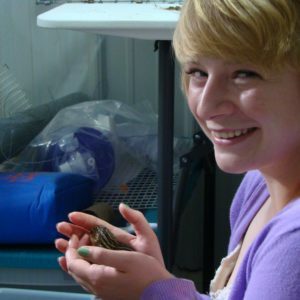 She is a Wisconsin native Wisconsin who studied English, environmental education and captive wildlife before leaving school to pursue opening her own wildlife rehabilitation facility. Cassandra strives to provide exceptional care to the wildlife that is brought to her facility, as well as compassion for the community members who find wildlife in need. Q: How did you get into wildlife rehabilitation? Q: Is there any wildlife rehab situation that really stands out to you? Q: Do you have any advice for someone who wants to get involved in wildlife rescue or rehab? Q: How do you bring awareness about wildlife rehab to your community?